I remember feeling a sudden surge of optimism when I first heard that George Mitchell was named special envoy to the Middle East. His appointment was a clear sign of the U.S. administration's sincere willingness to resolve the Israel-Palestine conflict. However, as the special envoy takes his second tour in the region, I admit that the initial optimism has already — let's just say — lost its intensity. Mitchell is a first-rate diplomat. His track record has earned him the respect of the international community. Back in 2002, he had successfully established a reputation for impartiality on the Israel-Palestine issue when he called for freezing Israeli settlement activities, as well as intensifying Palestinian efforts to crack down on terrorism. But a fundamental change has taken place since then; there is a new player in the conflict-torn region: Hamas. Hamas representatives voiced resentment when Mitchell did not make any attempt to communicate with them on his first visit to the region last month. "Not negotiating with the terrorists" is one thing, but it is hard to justify not setting foot in Gaza while claiming to be sincere about healing this shattered piece of land. Reputable and credible as Mitchell is, what this tells us is that there remains too much rigidity in U.S. foreign policy. Whether we like it or not, Hamas is one of the major players in this conflict and it's essential for the U.S. envoy to at least listen to what Hamas has to say. No offer or deal can be brought to the table unless accepted and supported by both Israelis and Palestinians. On this second visit, Mitchell again went to the Fatah-controlled West Bank and skipped Gaza. This can only be interpreted in the Middle East as renewed affirmation that American policy favors Fatah over Hamas, and that U.S. mediation in the conflict is unlikely to be impartial. George Mitchell has taken on a very challenging and tough mission. The last thing he needs is to have his impartiality as a mediator questioned from the get-go. When Barack Obama was elected U.S. president, Turkish pundits instantly likened him to Turkey's Prime Minister Recep Tayyip Erdogan. Like Obama, Erdogan is a political outsider. He is a grassroots leader who campaigned on a slogan of change and was rewarded with a landslide electoral victory — twice, in 2002 and 2007 — becoming the leader of the first single-party government in decades. Turks overwhelmingly elected Erdogan not because of his Islamic credentials — the hard-line Islamic vote in Turkey is generally around 10 percent while the Justice and Development Party (A.K.P.) won with 47 percent in 2007 — but because he represented a young, new breed of politician, the hope of more democracy, an end to corruption and cronyism, and economic stability. But six years on, Erdogan is faltering and Turkey appears to have lost its way. A determined campaign to make Turkey an E.U. member has stalled, replaced by a more pro-Arab foreign policy in the Middle East. Erdogan has failed to resolve the two-decades old Kurdish conflict in the southeast (which spills over into Iraq). He brooks little tolerance for media opposition and abandoned plans to democratize the Constitution in favor of a bitterly divisive overnight bid to allow headscarves in universities. Under the A.K.P., Turkish society has become increasingly polarized. The message Obama's Middle East envoy George Mitchell needs to take back to Washington is this — help Turkey get back on track on E.U. membership, democratization and resolving the Kurdish conflict. During the Bush regime, Turkey became one of the most anti-American nations in the world — a recent Pew Global study found only 12 percent of the Turkish people approve of the United States — and yet it is a key ally, or "peace partner" as Mitchell mentioned, in a troubled region. Obama needs Turkey's support to succeed in Iran, Iraq and Afghanistan, and possibly even in brokering an Arab-Israeli peace deal. After years of being led by Western-educated elite, the so-called "white Turks," Erdogan's victory finally gave the conservative Anatolian hinterland a much-needed political voice. The task now is to balance two visions of the country's future. Turkey can yet find its identity — both Western and Eastern, politically secular and mainly Muslim, constitutionally liberal and socially inclusive. 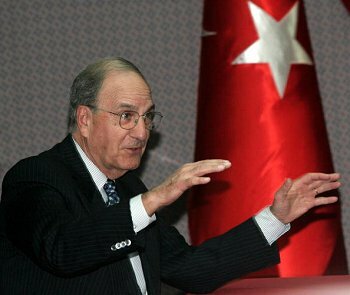 But with European leaders frustratingly myopic over Europe's future and focused on their own internal political dynamics, it's up to Ankara to restructure ties with the new U.S. administration, and up to Washington — through the likes of George Mitchell — to extend Ankara a helping hand. Defne Samyeli is a journalist for the Daily Gunes in Turkey. Pelin Turgut is a Turkish political and cultural commentator for TIME magazine and The Independent.